First up I confess it – I’m a dreadful nurse. My sympathy lasts all of 5 minutes, 10 maximum, after which I think we should all just move on and pretend nothing untoward is happening. Given this insight into my empathy skills, you may have some sympathy for my husband who has been suffering from tooth ache for the best part of three weeks now. For the first couple of visits to the clinica dental, armed only with his 3-months worth of Spanish lessons and a few specific phrases translated via Google Translate and our impressively large Oxford Spanish Dictionary, he bravely set off alone and returned with a numb mouth and prescriptions for medication he wasn’t entirely sure how/when to take. Showing a remarkable degree of pity I suggested going with him last week. Whilst no expert, my Spanish is marginally better than hubby’s and anyway, I figured two beginners are probably better than one. Sure enough, we did seem to make a little progress in understanding the problem and likely healing time. I’m pleased to report that he is, slowly but surely, on the mend. Yes, yes, I know, tooth ache is horrid and you can’t ignore it and, and … But come on, if you can eat chocolate, it’s not that bad!!! Where else this week are you going to read about teeth and babies in the same post? And not even the teeth of babies. I’m talking newborns. And more precisely the little girl born prematurely in Spain a few weeks ago to an English mother who was then separated from her daughter for 3 weeks whilst DNA tests were carried out. This story is still all over the media and it’s driving me crazy. The lady in question had her baby in Spain, not in a hospital but at ‘home’. She went to hospital the next day – to a place where she was completely unknown with a newborn baby and presumably no medical records, paperwork etc. In Spain the law (I believe) dictates that her and the baby should remain in hospital while tests are carried out to make sure a) they are both in good health and b) that the baby does indeed belong to the ‘mother’. Had she abducted this baby – yes, I know she didn’t but bear with me. Had the baby been abducted and the media picked up the story and the hospital had to admit that yes some completely random woman had walked in with a newborn claiming it as her own and they had done nothing to check the validity of her claim – they would be being crucified in the media by now and everyone would be screaming about how this could happen. My gripe is that, in my personal opinion, the media is making a big deal out of a non story. The lady in question was in a foreign country – she was not in England where she speaks the language and could presumably have explained her situation better. Don’t we have enough issues in Europe at the moment without creating divisions and demonising another country’s professionals for acting in perfect accord with their own laws? Silly season or not, watching a new mum saying she’s so traumatised she might never come back to Spain is just plain trouble making. Come on media – I for one expect better from you. My day job is an interesting combination of marketing writing, teaching Business English and being on the Community Aid Committee of the wonderful Hanoi International Women’s club. And of course those tasks get juggled alongside everything else that most women (and yes, some men) deal with on a daily basis – currently that includes moving house. So it will come as no surprise that I cannot function without a daily To Do List, combined with jottings and slips of paper in a desk calendar, a pocket calendar and electronic calendars all neatly synched between laptop, iPad and phone. Simply keeping these aide memoires up to date and colour co-ordinated regularly provides endless hours of entertainment (I think that was someone’s catch phrase but don’t know whose?). In that wonderful way that only the universe fully understands, my various ‘worlds’ often overlap and merge in a very satisfying way (and occasionally collide in a less pleasant manner) and I marvel every time when I’m asked to write an article on a subject that is just the topic I need to know more about at that particular time. Two recent examples illustrate my point. The first, more positively than the second, was an article I wrote for an e-newsletter where the topic was how to handle email overload in the office. I have the Post It Note in front of me as I type: Do, Delegate, Designate Time and Dump and I have to say, this system works very well for me (when I remember to use it!). The second article was a longer piece about business blogging – why you need one and how to get started. Researching this article had me engrossed and I enjoyed writing it so much I even decided to implement some of the advice. An hour or so later I had a hand written, a typed and an Evernote version of my blog’s mission statement, frequency, editorial calendar and keywords. And since April I think, from memory, I’ve posted about two blogs and probably not actually covered any of these topics. In fact, I haven’t felt inclined to blog at all. What had been a pleasure that I admittedly didn’t indulge in as often as I would have liked, had suddenly become a chore. Creating this plan took all the creativity out of the process for me. What had been fun has now become work. Three months later here’s what I’ve learned – not all plans are good plans, you don’t always need a plan and – if it isn’t working ditch the plan! So, hopefully I’ll be back more often and writing about the stuff that appeals at the time of writing rather than following a ‘features calendar’ and hopefully my readers will enjoy the randomness of ad hoc writing. 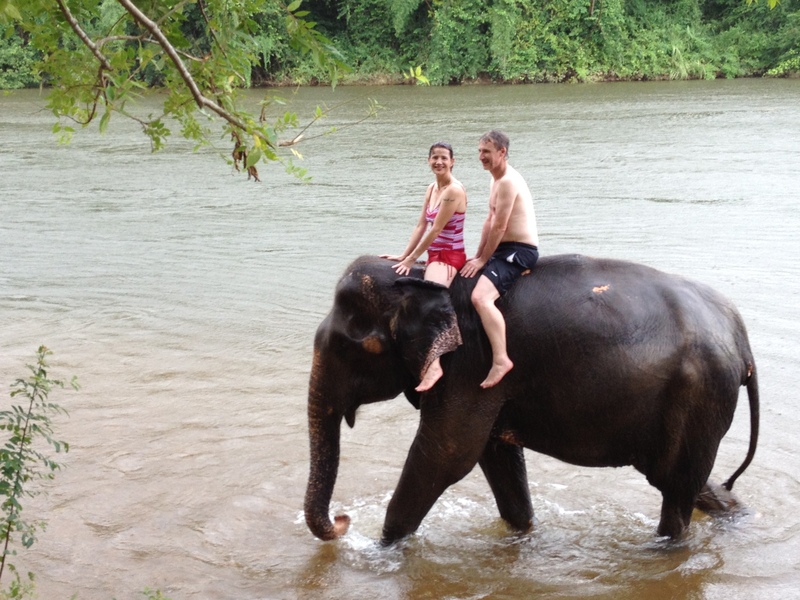 I’ll leave you with a photo of me and the hubby getting soaked playing splash with an elephant in Thailand – just to bring the fun back into this blog! Having been here for three weeks now I fully intended to write once or twice a week but this has been wildly unrealistic. Why? Because there is so much to see and take in as a newbie that just living it is enough without re-living it by writing about it all!!! I have one of my son’s with me for a couple of weeks so, in addition to acclimatising and finding us a house, supporting my husband when he comes home totally exhausted and trying to get to grips with having a dog in a city that neither of us knows and she hates the constant stream of scooters whenever we set foot outside the apartment – I just don’t seem to have the energy to write. I don’t want to write when I’m too tired because I don’t want a negative or low-key blog – I’m loving it here and want that to be reflected in what I write. I have been keeping a list of things I want to write about and I hope to get around to them all at some point but for now I’m going to share with you one note I made that seems to make perfect sense but I can’t for the life of me remember exactly what I intended to say about it!!! The note reads: Often messages misleading. When I work out what I meant by that I’ll share it with you For now though I’ll just make a couple of comments. My son and I have just come back from a fabulous street foods tour with Tu from Hanoi Street Food Tours – check out his blog at vietnamesegod.blogspot.com and had an amazing time. What I felt really strongly though is that I need to start learning Vietnamese ASAP because I’m going to miss so much of what’s happening around me if I can’t converse properly. Food is a passion and I really want to buy locally and eat seasonally – for that I need at least some words and phrases. So, top of my To Do list is to get some lessons!!! The second thing I wanted to share is how tough it is when you first arrive if you have family ‘back home’ because I find myself living in two time zones. Everything gets translated back into UK time so that I don’t miss speaking to the kids or my parents because I’ve got the time wrong. Also, I’ve kept a client in the UK so have to make sure that I keep to the deadlines – in UK not Vietnamese time. This so far has involved me living a full day here in Hanoi and sitting down to ‘work’ at about 7p.m. knowing that I’m still well on target for the UK working day. That’s not sustainable long term as I’ll be exhausted but for now well, …. So, all good, more tiring than I expected and things move at their own pace which is as it should be but takes some getting used to for a controller like me!